The Goya II harness is an evolution of the very successful Goya. 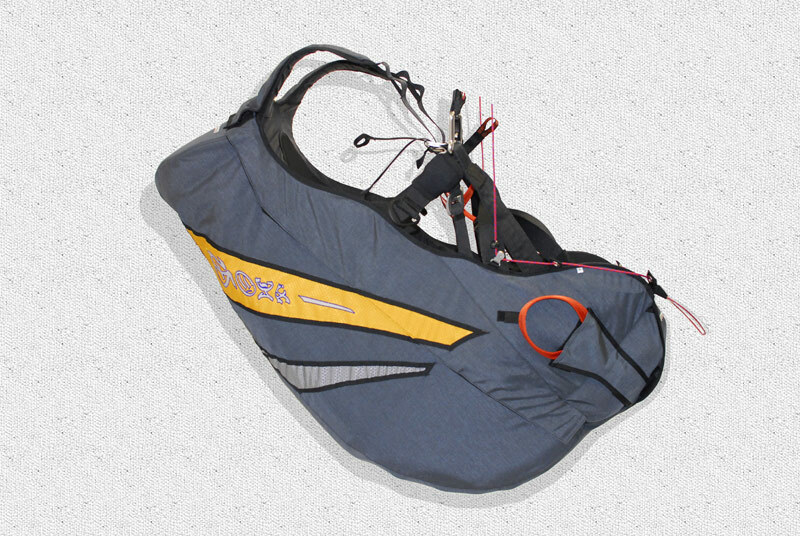 The Goya II is a light, spacious, aerodynamically cut ABS harness suitable for entry-level to intermediate pilots. Special plastic reinforcements and a wide range of easy adjustments make the Goya II an unrivalled harness for pilot comfort during long flights. 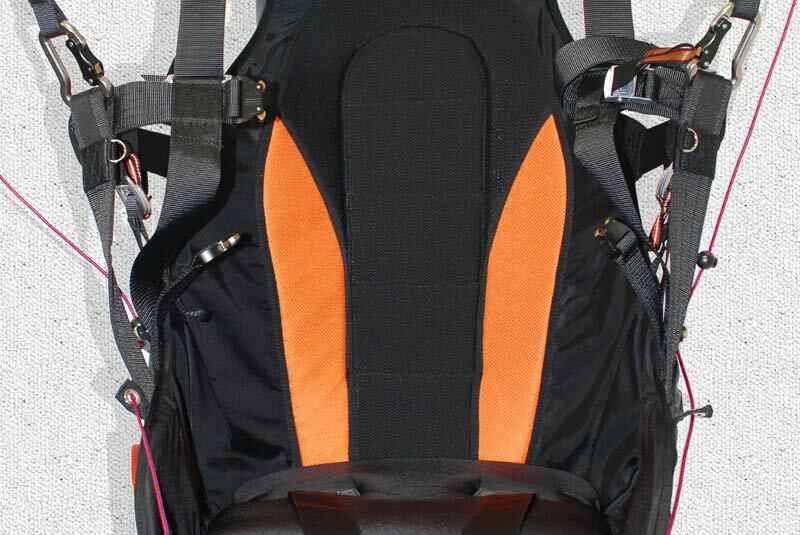 The back area is made from “breathable” fabric in a combination of black and orange colours. This minimizes sweating and has a more attractive appearance. A well designed leg strap system allows the pilot an upright position before and during take-off, making checks very easy and doesn't inhibit take-off. There are adjustment bottom lateral straps to change the sitting position. The seat plate is now longer in the Large and Extra Large sizes compared Goya I and offers the pilot additional support to the legs combined with improved comfort. 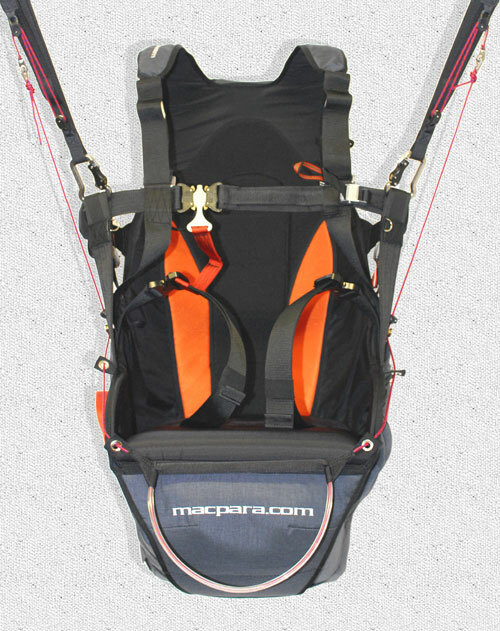 A security T-bar prevents the pilot falling out of the harness if he forgets to fasten the leg straps. The carabineer separation (which controls the sensitivity of the harness) is adjusted by a trimmer on the chest strap. The speed-bar maintains the correct position in front of the pilot automatically and makes the use of the speed system during flight very easy. The rescue canopy container is placed under the pilot's legs towards the front of the seat and is integrated into the shape of the harness. It uses a tested “envelope” system with two pins with right-handed deployment. Left-handed deployment can be supplied to order. A sufficiently large deployment system guarantees easy removal of the rescue canopy from the outer container. The reserve handle is highly visible and easy to reach. This is now lighter and is positioned higher; it is fastened with Velcro to the side of the harness. The large rear pocket is equiped with a 18 cm foam back protector which leads towards the front of the seat and is integrated between the seat and rescue container. There is plenty of room left over for your rucksack and other goodies. Goya II can be further equipped with lateral protection with plastic plates providing increased protection in the hip area. Goya II has a larger side pocket to carry items you may need to access in flight. All MAC PARA harnesses are produced from CORDURA material and precisely made, you can be sure that even after several years use, it will serve you as well as it did when new.